Did Hollywood Today Plagiarize American Power on Tareq Salahi’s Palestinian Ties? Look, the New York Times first broke the news that Tareq Salahi, the White House gate-crasher now under investigation for the massive state dinner security breach, had ties to Palestinian rights organization, ATFP. The couple that crashed a State Dinner at the White House had ties to the American Task Force on Palestine, Hollywood Today has confirmed. Tareq and Michaele Salahi, who may have been there posing as a team from Bravo TV, (the husband-wife team has been auditioning for a role on Bravo’s “Real Housewives of Washington D.C.”), so Bravo should either hire them as resourceful, or more likely turn over all correspondence to the Secret Service under threat of abetting potential terrorists and revoking Bravo’s FCC license — if the network was involved in the set-up. The way it works, according to former White House press aide Edward Lozzi, is that the White House sets up the guest list well in advance. The Secret Service then vets the individuals. It is not a rock concert, you can’t sneak a peek at the guest list and use someone’s name or slip in a backdoor. Already, various Arab groups are making the Salahis heroes of the anti-U.S. or anti-Israeli causes on the Internet. So why were the Salahis allowed on the list? True, the Palestinian organization they both have ties to, the American Task Force on Palestine, claims only the most peaceful intents — so maybe the couple was invited by someone in the White House who believes this. We do not dispute AFTPs insistence of peaceful goals without proof one way or another, yet in the recent past, the AFTP has been accused of America-bashing and promoting power-sharing with self-acknowledged terror group HAMAS. 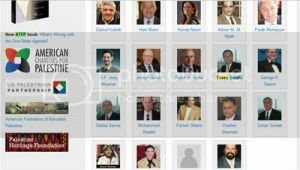 So why is Tareq’s image on the ATFP webpage gone, as are most references to him and his wife? They are scuttling even faster than Bravo to distance themselves from what they may figure is a time bomb. The ATFP picture shows Tareq as a board member of their group a week ago. He has been deleted now. In addition, and ominously, it turns out that Tareq Salahi, the polo-playing intruder, is a Palestinian nationalist with ties to the American Task Force on Palestine (ATFP) , a pro-Palestine lobby demanding the “right of return” for all Palestinian refugees and their descendants. The “right of return” has long been considered the backdoor to Israel’s destruction. But not only that: ATFP President Ziad Asali is an America-basher who blamed 9/11 on U.S. foreign policy in the Middle East. Asali was a lead U.S. official to PLO terrorist Yassir Arafat’s funeral in 2004. And in a position paper in 2007, the ATFP called for a power-sharing agreement at the Palestinian Authority, which would have included the State Department’s designated-terrorist group, Hamas. That’s all it takes, a quick link to serve as a citation for your sources. Even near-verbatim paraphrasing is cool as long as you link back to your source as a courtesy. Norms for citation are obviously lax on the net, and folks snag a lot of graphic material, pictures and stuff, under reasonable claims of fair use. But Hollywood Today is passing off online investigative research into THE SIGNIFICANCE of Salahi’s Palestinian ties as its own. And that’s what bugs me. I’m just another blogger out there, but when I dig up and analyze a good bit of information, whether a big deal in the end or not, I wish to be credited, at the least.